Intriguing events are taking place at Anniversary Towers once again. This time however, it is not an election dispute. Three former commissioners who resigned publicly at a press conference and sworn in court affidavits that they had communicated their resignations to the President returned to their offices to resume work…months after they resigned! Former IEBC commissioners Margret Mwachanya,Consolata Nkatha Maina and AMB. 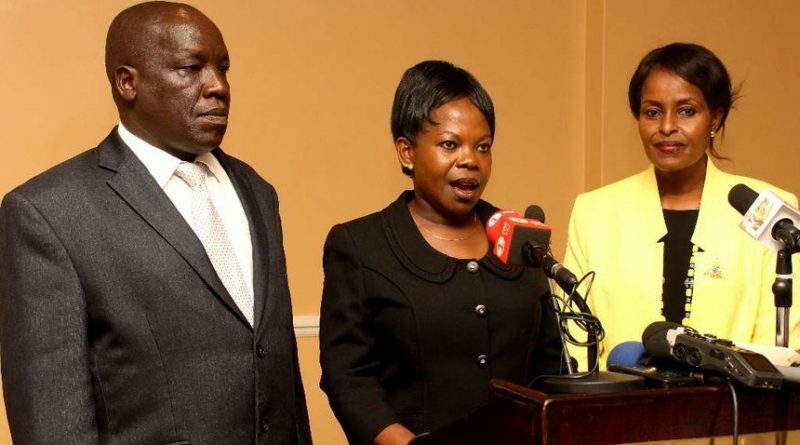 Paul Kurgat issued their resignation statement at Sarova hotel on April 16,2018. “I formally tendered my resignation letter to the President as is required under the Independent Electoral and Boundaries Commission Act,” three separate affidavits signed by the former IEBC commissioners state. But yon Monday, in contrast to their noisy and well-publicised exit, vice chairperson Connie Maina and commissioner Margaret Mwachanya slipped back to Anniversary Towers that houses the IEBC headquarters — to the consternation of the staff and Chebukati. The three said they could not be blamed for failure by the President to declare vacancies occasioned by their exit. “As far as I am concerned, I have resigned as a commissioner but my resignation is yet to be officially communicated and no vacancy has been declared. It can therefore not be said that I am the reason recruitment has not commenced,” they argued. An attempt by three former Independent Electoral and Boundaries Commission commissioners who resigned in April to return to their offices on Monday was thwarted by chairman Wafula Chebukati. Mr. Chebukati insisted that the three commissioners; vice-chairperson Consolata Maina, Paul Kurgat and Margaret Mwachanya resigned from the commission and are not supposed to work at the agency. “The procedure of resigning and clearing is very clear, they returned all the assets of the commission; vehicles, laptops, phones, badges… as far as the commission is concerned, they are no longer commissioners of IEBC,” said Mr. Chebukati. The chairman said he was surprised when two commissioners, Maina and Mwachanya returned to their former offices on Friday which forced him to change the locks after they left. “IEBC does not have offices of former commissioners, as far as we are concerned, they are not supposed to be working here. They came on Friday, we were surprised to learn they had retained some of the keys which they had not handed over but that has now been rectified,” he added. When they returned on Monday to find new locks, they commissioners are said to have attempted to see Mr. Chebukati who refused to meet with them. It is not clear if the three are still receiving their salaries.